Parital Anjaneya Swami Temple is a statue in depicting Hanuman. 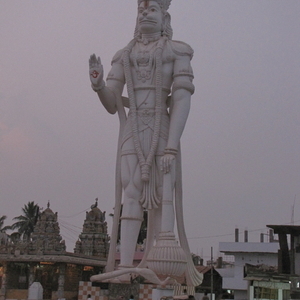 It is the tallest statue of Hanuman anywhere in the World, and the tallest statue in India. It is located in the village of Paritala on NH-9 road side, approximately 30 km from the city of Vijayawada, in the state of Andhra Pradesh, India. The statue, installed in 2003, stands 135 feet tall (41 metres). This Tallest Statue of Hanuman in the World is Taller than The Tallest Statue of Human figure made by Western World i.e. Christ the Redeemer statue in the city Rio De Janeiro, Brazil. This worlds tallest standing Hanuman statue attracts many devotes both foreigners as well as domestic. The forth tallest Hanuman statue at Carapichaima, Trinidad and Tobago - 85 ft, this is the tallest Hanuman outside of India. Here's the our members favorite photos of "Temples in Vijayawada". Upload your photo of Paritala Anjaneya Swami Temple!